Do it yourself Halloween craft with swag. It's an easy craft and when it's done you can hang it anywhere. Add your personal touch to it. Stars, one each: 6" x 1", 4" x 1"
Wax serrated knife with candle stub or paraffin. 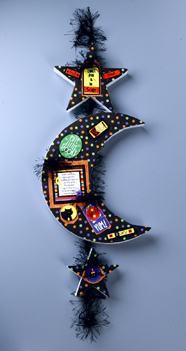 Draw crescent moon shape on foam disc and cut out. Note: Electric foam-cutting tool may also be used in place of waxed knife. Trace moon and stars onto dot paper; cut out and glue paper to foam. Using photo as a guide, mat stickers on cardstock and decorative paper; adhere to moon and stars. Cut four 4" lengths from yarn. Wad yarn pieces into balls and glue to moon and stars as shown. Cut one 60" length from yarn and fold in half to form hanger. Position shapes as shown and glue hanger to back of each shape.